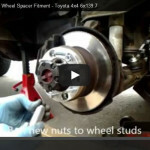 How to install 30mm wheel spacers on a Toyota 4x4 Hilux pickup. This video explains the best procedure from start to finish of fitment. We cannot stress enough to NEVER USE AIR TOOLS when fitting any aluminium wheel spacer. Click here to view all Wheel Spacers for your Toyota 4×4.